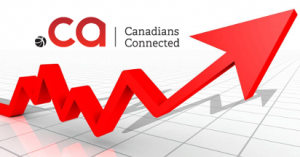 The Canadian Internet Registration Authority reports that .CA is one of the fastest growing TLDs in the world. It ranks fourth among its country code top level domain (ccTLD) counterparts. Since 2007 Canada has recorded a growth rate above 50%, which puts .CA level with .FR (France), .AU (Australia) and .BR (Brazil). Canadian domain extension have now become more popular than .NL (Netherlands) and .SE (Sweden). Over the past five years .CA’s market share in Canada has increased from 21% to 30%, for the most part at the expense of .COM domains. This is a very interesting development. The total amount of .CA domains registered is over 2 million. The growth of .CA is particularly impressive keeping in mind that, unlike many other popular ccTLD’s such as .DE, .CO.UK and .MX, there exists a local presence requirement which must be met in order to be able to register a .CA domain. Foreign applicants must either register an alternative top level domain, or find a local trustee or agent to act as middleman. Another option is to register a Canadian trademark. Owners of Canadian trademarks can register a matching .CA domain, regardless of their nationality or physical location. How can I register .CA domain name without a physical presence or trademark in Canada? Web Solutions offer a Local Presence Service for .CA domains. It is free of charge. For more information, use the order module on this page, or contact us. Per viewer, Canada leads the world in viewing online video. In order to register .CA domains, use the domain name search form located below or contact our support team for information on how to secure your .CA domain extension. Applicant must be based in [COUNTRY], or hold a [ADJECTIVE] trademark. Web Solutions also offer a proxy registration service through our [ADJECTIVE] based agent.